Shelters of some sort, rooms, have been a major theme since the beginning of my sculpture making. With open walls, they are spaces that are both defining and liberating. This work is about shelter, about being sheltered. 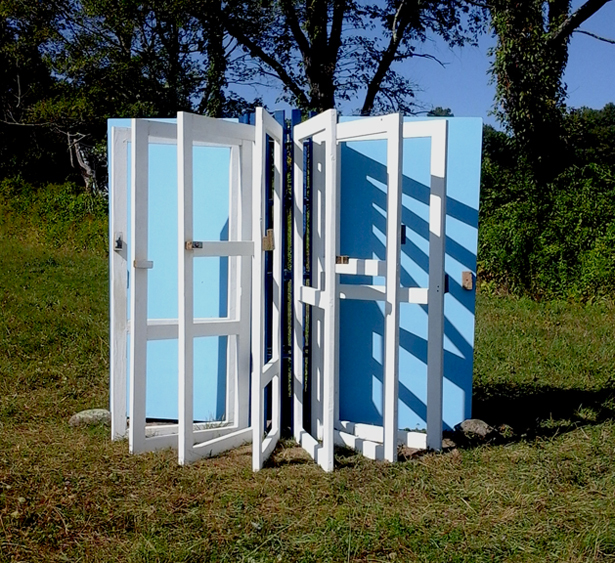 Outside you see a stark maze of doors, the panels missing, an environment that is both sheltering and exposing. There is one dim light. Inside, hidden within the labyrinth of doors, are collages and poems by women living in domestic violence shelters, illuminated by flashlights turned on by viewers. These are the hidden visual voices of women who have been forced to flee to safety with their children, giving up community, possessions, and financial stability. The collages express the entire gamut of emotions from rage and grief to hope and good expectations. I give an art workshop at a soup kitchen. 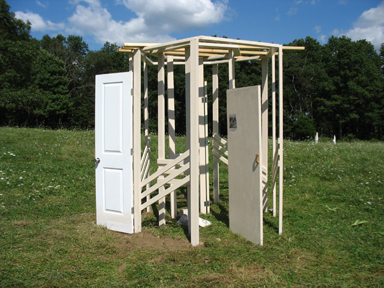 The obvious next step is to put together what I learn from my students there with my art practice and current obsessions – doors, and always shelters, always some kind of room. The doors in this work have “book covers” that were hollow core doors. 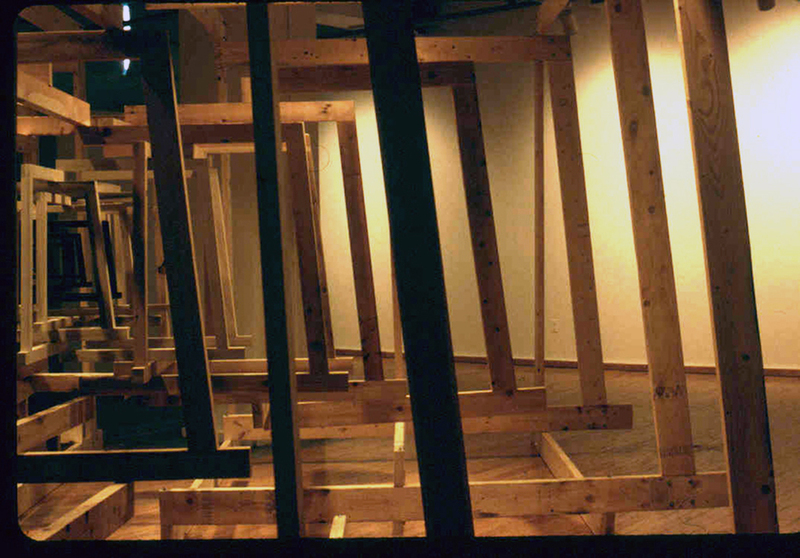 The “book pages”, built from 2x4s, have missing panels, and door-pulls made of cardboard, the iconic material of homelessness, or our idea of it. The door pulls are collaged with text and photos removed from books. The “spine” is supported inside with ribs of tossed-off bent bicycle wheels. Shelter for me might mean reading a good book in a quiet corner, but out of the corner of my eye I acknowledge that someone else has an entirely different idea of that word, shelter. Conceived as “A Gazebo”, this work was hopeful about the possibility of peace in the West Bank. But during its development, the entire Middle East met calamity after catastrophe (2014), and the piece changed accordingly. I could no longer festoon its surfaces with colorful Palestinian and Israeli cultural icons. It’s still a quiet piece, because I am still a minimalist, that is, making my point with the least amount of structural material, but I’m hoping it causes people to reflect, to be moved, and to ask – what does she mean by that?, as I have been moved to ask myself. I hoped that by calling it “There Once Was a Gazebo”, people would know I meant there was a peaceful place and now there isn’t, and I hoped that the two newspaper photos in the piece would convey that I am now talking about Gaza without telling people what to think. The aesthetic solution is a very important aspect of all my work – room-like, lines, shadows. House:ב׳ת begins at center with a single one-inch high ב, the second letter of the Hebrew alphabet (spelled out ב׳ת, pronounced beyt ), and, with increasingly larger repetitions of that form, grows into an eight-foot tall “house” (also ב׳ת, pronounced bayit). In Jewish tradition it is said that the world was created from the Hebrew alphabet, starting with ב, and this letter is symbolically paired with the myriad concepts of “house”, from its sacred and spiritual meanings to its very earthy and commonplace meanings. The material in House:ב׳ת progresses from cherry wood in the innermost room, through furniture grade poplar, and then cedar, to the outer “rooms” of ordinary house construction pine. 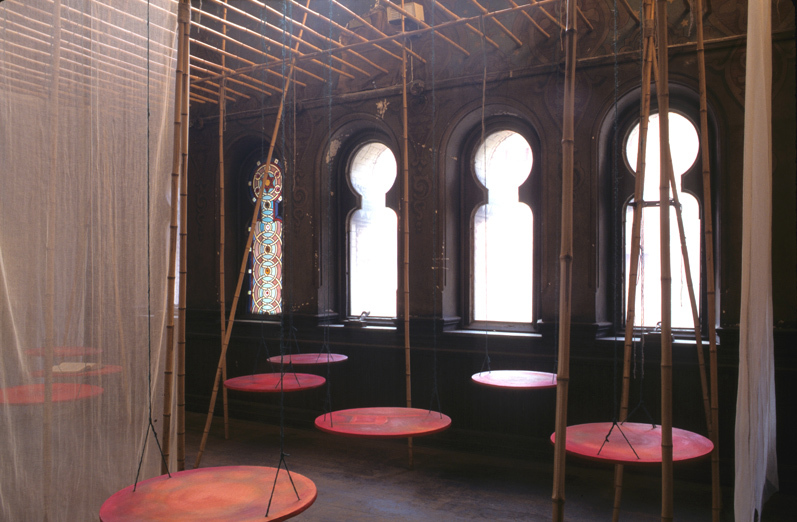 I was invited by the Eldridge Street Synagogue to build an installation for Sukkot, the Jewish holiday with a dual significance: historically, the forty-year period of wandering in the desert, living in temporary shelters, and agriculturally, a harvest festival. My thoughts were also on the many homeless living in New York City, and I wove these narratives together with my formal attention to lines and space. In Private Rooms, a childhood memory of a shared bedroom is filtered through the ensuing choreography of events and through the gaps in the emotional web created by the passage of time. 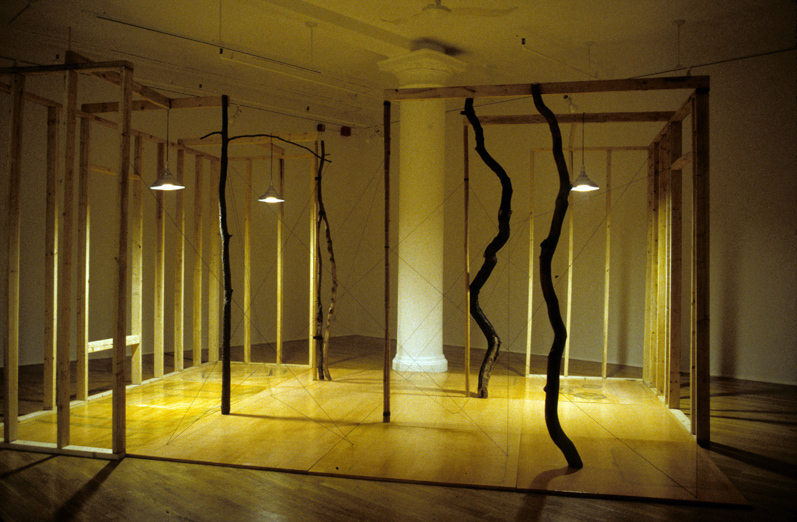 Branches, poles, and taut cord describe shifting geometric planes, seemingly engaged in dialogs amongst and around one another. While most of the floor plan is obscured and forgotten, the work insists, nevertheless, that some memories are true.